The Aitutaki Day Tour is the easiest and most affordable option to experience the magic, tranquility and beauty of Aitutaki’s breathtaking lagoon. Whether you are single, a couple or a family with children, this is the tour you cannot afford to miss. Aitutaki is the ideal place to get away from the hustle and bustle of the modern world. It is just a short flight from Rarotonga but seems to be worlds apart. It epitomises an image of Pacific Paradise islands, fringed with white sandy beaches, gently swaying palm trees, a turquoise lagoon sparkling in the bright tropical sunlight and a pace of life in tune with this tranquility. There is no better way to fully experience the beauty and charm of that magical place than to experience the all inclusive Aitutaki Day Tour from Rarotonga. Jaw-dropping views, relaxing atmosphere, swimming and snorkelling spots teeming with an array of colourful tropical fish and majestic giant trevallies, visits to sun-soaked islets (motus) and tropical buffet lunch make up for an unforgettable day. 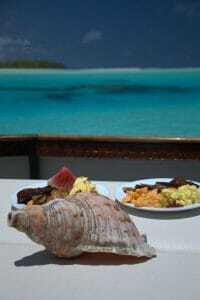 It is an experience no visitor to the Cook islands should miss! 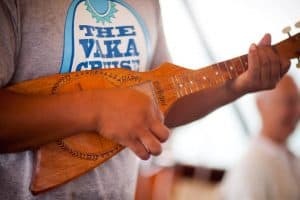 You can experience the beauty and the bounty of Aitutaki’s lagoon and its many islands including One Foot Island right from the front door of your Rarotonga Hotel or accommodation all the way to our double hulled traditionally styled Vaka cruising Aitutaki’s wide turquoise lagoon. Every morning starting at 7 a.m. our transfer buses circle the island of Rarotonga to pick up our booked Aitutaki Day Tour passengers from their accommodation for the short trip to Rarotonga International Airport from where the 8:00 am flight to Aitutaki will depart for its 40 minute flight to Aitutaki. Breathtaking views of Aitutaki Lagoon give the first impression of what lies ahead. The Aitutaki Day Tour is designed with a lot of care to showcase all the best places in Aitutaki and fill the day of our visitors with breathtaking views, gentle activities and a relaxing atmosphere. We have frequent visitors not only over the years but also serial offenders who fit in more than one Aitutaki Day Tour or return to stay in Aitutaki and book the Cruise only, time and again. Get away from it all – just let yourself be carried away … onboard of our Vaka into the big, wide turquoise of the Aitutaki lagoon. Legend describes his voyage on a twin hulled vaka at O’otu through the clear calm waters of big turquoise of Aiututaki lagoon, feasts on seafood and abundantthe abundant sweet coconuts available on the motu (small islets) that encircle the lagoon. The lagoon’s waters teem with marine life, including rays, bonefish and turtles. Near the main town of Arutanga, trails lead to the top of Maunga Pu hill. Today, home to the world’s most beautiful lagoon, the island is a romantics gateaway, weddings and a popular honeymoon destination in the South Pacific. Some of the most beautiful Cook Islands resorts are based here. Visitors to Aitutaki can experience the beauty and the bounty of the lagoon and surrounding waters on our Vaka Titi ai Tonga. Even though It’s the second most visited destination in the Cook islands until now it has been spared by mass tourism. Tapuaetai (One Foot Island), one of the small small islet the Lagoon Cruise will take you too, is often said to be the most important attraction. It is regarded as providing the visitor with the best views of the Aitutaki lagoon and, depending on the tide, one is able to walk on a sandbank a decent distance away from Tapuaetai. It is here that one is able to swim in the crystal clear and deep water separating Tapuaetai from its neighbouring islands. Which is larger, 16 or 14? This simple math quiz makes sure you are not a robot.